littleBIGBELL A cool guide to Margate - what to see, eat and where to shop. 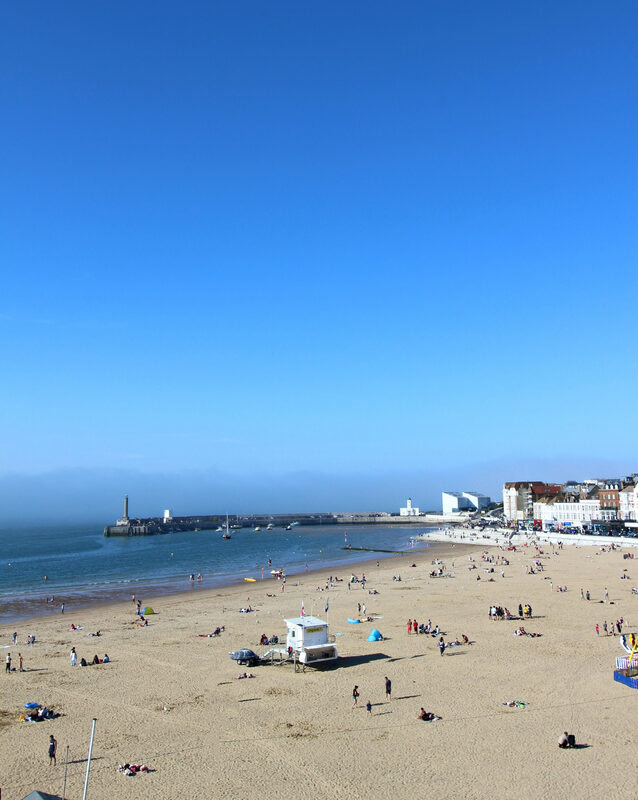 A cool guide to Margate – what to see, eat and where to shop. Margate on the East Kent coast has been dubbed the new Shoreditch. Are you curious to see how this old English seaside town is being transformed? I’ve been wanting to visit Margate for a while, but haven’t had time. I’ve only been there once briefly for a photo shoot, but didn’t get to explore the town properly. Consequently, one sunny weekend, I decided to take a day trip there with my family. It was an easy hour and a half journey via Southeastern rail’s high speed train from London’s St Pancras. The trip was relaxed, pleasant and definitely beat being stuck in car traffic. As we got out, we could immediately sense that old style English seaside vibe. I was especially happy, since the beach was a sandy rather than pebbly. Here is a cute fair for kids on the beach. You could try Dreamland opposite the beach too, if you fancy more thrilling rides. Before exploring Margate further, we decided on breakfast, because a weekend just isn’t a weekend without a hearty start right? We stumbled upon The Bus cafe, a converted double decker bus restaurant with seating upstairs. I had a Hangover Hash, which was a potato and red onion base rosti with refried baked beans, eggs, peppered mushrooms, bacon lardons and sausage. It was delicious and definitely fulfilled the brief of something hearty. This was the eggs and mushrooms on sourdough toast that my husband had. After breakfast, my husband and son decided to go onto the beach for some fun and games. I decided to explore Margate’s Old town. 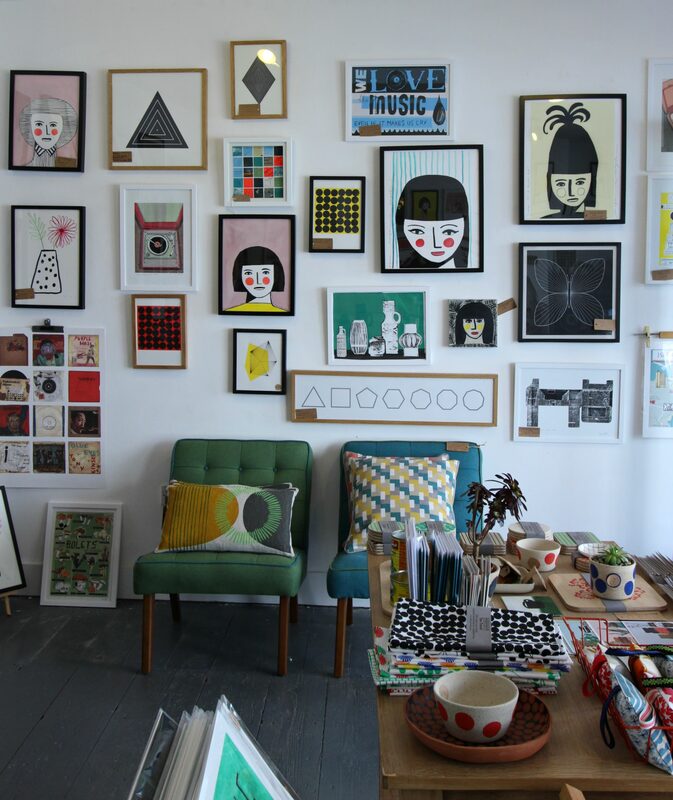 My first stop was Caravan Margate, a pop up store, where 6 creatives from Thanet were showing their works for sale. It will be opened until the end of August 2018. The brands on show were Margo of Margate, Frame and Cover, Ms muffet upholstery, Jane Ellison textile, Kavel Rafferty and Redpen print. I was rather taken by Margo’s original art portraits, hence went on to purchase 4 pieces. Love this upholstered chair by Frame and Cover too. The Old Town was definitely the place to be for cool independent stores and restaurants. I was also happy to discover Little Bit Margate and to meet the owner Polly. Just look at her cute shop bursting with colourful happiness. Everything was beautifully curated, quirky and cool. I had my eye on that cute llama ceramic money box and those fun disco ball cups. I finally left with a unicorn ring holder. These sweatshirts with colourful tassels are totally adorable don’t you think? If you love art, then you’d be glad to hear that there were many galleries peppered throughout the Old Town area. Don’t you especially love it when you wander around a new city and then discover a hidden gem? Most of the stores were in the Old Town, however, I found Mar Mar Margate in Cliftonville, a less regenerated part of town. 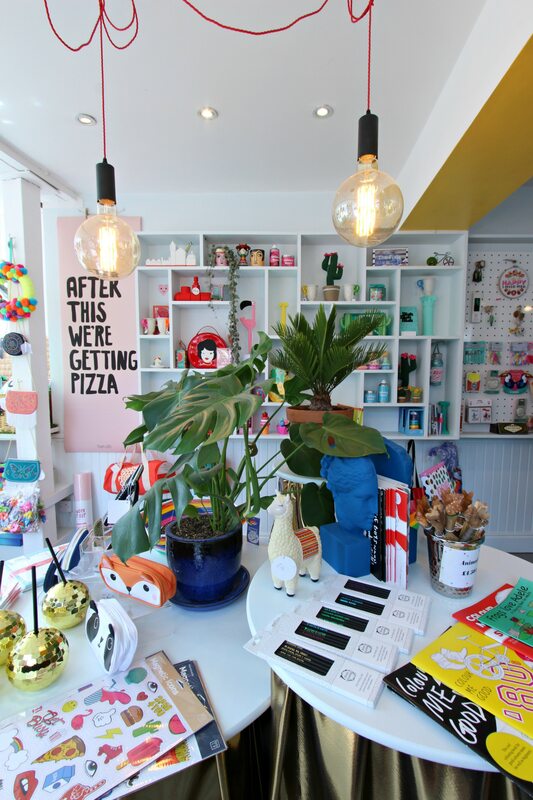 Mar Mar Margate is a cafe and store selling stationery and plants, owned by Boe Holder and Henry Buckle. Boe paints the prettiest of pots to sell with her plants. Q1: Tell me a little about your backgrounds. I’ve been working as an artist and homewares designer for the past four years for my brand This Way to The Circus, which I started after leaving university. Henry has worked in music; writing, producing and engineering for the past decade. He now works in digital arts and installations. Q2: What made you move to Margate? We moved to Margate from London over two years ago, and were drawn to the space, light and creative opportunities. We were able to set up our own business here, something we could never have been able to do in London. We’d drive out of London every weekend, hoping to find the place for us and eventually we made it to Margate, literally as far as we could go east without driving into the sea. Something about the town was immediately exciting and intriguing, we started looking for flats that day! Q3: Tell me about Mar Mar Margate? Mar Mar is a cafe/ shop and bar. Our aim was to make a beautiful, calm space in which to enjoy excellent coffee and produce. Our small shop section has been carefully curated, stocking only products we love ourselves. We designed, sourced, built or commissioned every element of the space ourselves, the interiors reflect a meeting of both out design sensibilities. We wanted to move into the future while being respectful of the past. This was reflected in the choice of our interiors. There are lots of classic touches like the brass worktop, restored 60’s mirrors, 70’s inspired plant choices, hand brushed original floorboards and original victorian tiling shown off and framed by simple yet modern planters. We went to great efforts to use a mix of materials and colour choices that will hopefully be timeless. Plants are obviously very important to us, they make us happy so we wanted to open a space full of them for others to enjoy – the plant sales have taken us by surprise! Q4:How have the locals responded to Mar Mar Margate? We’ve had a wonderful response from local people. Northdown Road was once a high class shopping destination, but seems like through the years had fallen from grace, but new energy and additions to the street have, in our experience, been met with enthusiasm. One of our main aims is to be as open and inclusive as possible, we want everyone to enjoy Mar Mar. We’ve got a great mix of people coming in and it seems like locals are quite proud of something like this popping up out of nowhere in an area that has received no attention for quite some time. We do get a few funny looks and double takes as people notice the jungle inside for the first time. 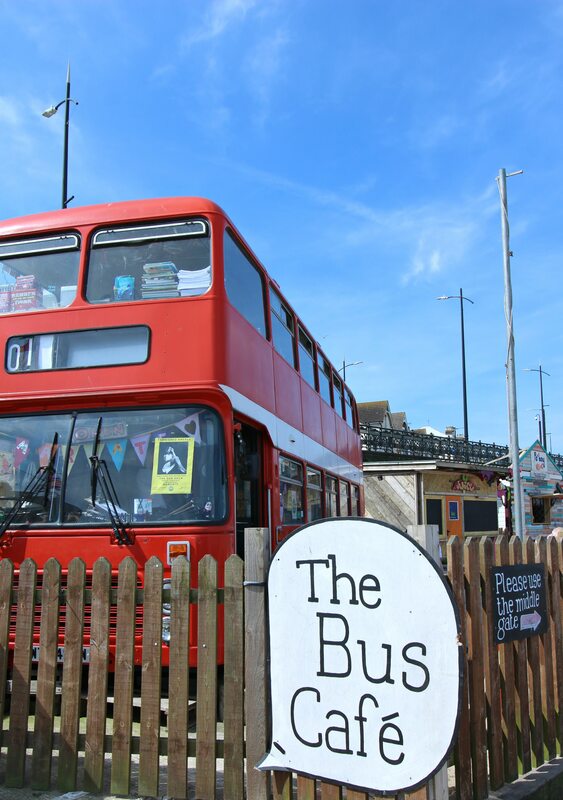 Q5: What are your favourite places to visit and eat in Margate? Hantverk & Found: Proper seafood restaurant with a continually rotating menu. Cheesy Tiger: French and Italian peasant food, on the harbour, you have to book to avoid disappointment. If you aren’t a fan of cheese and wheat then this is probably not the place for you but if you are it’s amazing. Cyrils Sandwich shop: everything a classic sandwich takeaway shop should be. Radio Margate: A local radio station, cafe and bar. Transmission Records: really cool specialist record shop and soon to be cocktail bar. Cliffs: Café, record shop, hair salon, yoga, coffee roasters, general community lead hub. Plenty of events going on. There isn’t much that Cliffs doesn’t cover. Tap Room: exactly what you’d expect from it’s title; a tap room offering great ales on rotation, a great place to hang out. Tom Thumb Theatre: an amazing and accessible events space offering comedy, theatre and music. It’s got one of the nicest feeling bars in town and has great curation. Post Office: newly renovated. A real treat for brunch. We recently helped them with their rebrand and installed a huge mount of hanging plants in the space. After much chat, I felt hungry. You can’t go to a coastal town and not try the seafood right? So for lunch, I met up with my family again at a nearby seafood restaurant called Angela’s. Their philosophy is to serve uncomplicated ethically sourced seafood alongside simple seasonal vegetable based dishes. We were lucky to get a table by booking in advance, as they have a limited number of tables and are open only from 12 to 230pm most days for lunch. I had the Scallops with garlic and onion purée for starters followed by this Dover sole with an anchovy dressing ( image above). I can see why all online reviews have given this restaurant 5 stars. The food was absolutely delicious and a treat to the taste buds. My husband had the red snapper which was equally delectable. After lunch, I decided to explore Margate’s famous vintage shops. I was instantly drawn to the pink facade of Peony Vintage, a vintage clothes store with collections of gorgeous floral dresses, perfect for Summer. Check out the beautiful dresses on sale here. It was so fun to stroll around Margate. There were loads of vintage homewares stores too, so perfect for those who love collecting unique pieces for their homes. How cool are these vintage alphabet signs? If you love Fairground vintage signs or accessories, then a visit to Fort Road yard is a must. There were many objects labelled either ‘Sold’ or ‘reserved’. Makes you wonder how people have room for vintage merry go rounds in their homes. This vintage Chips sign made me smile and especially hungry. Here’s more cool artwork on sale at Fort Road yard. I kind of fancy that pink Fresh Pop sign. I didn’t buy it because my hands were already full of shopping bags. Here’s another cool store I stumbled upon called Mor. You can see Turner Contemporary, one of UK’s leading art galleries from Mor’s shop window. Here’s the Turner Contemporary in its full glory. I didn’t get to go inside because I was running out of time, but definitely on the list for my next trip. Anyway, after a busy day exploring, we settled for some amazing pizza at GB Pizza followed by some Aperol Spritz on Ziggy’s rooftop bar. Here’s what Ziggy’s rooftop bar looked like. The view of the beach from the rooftop was noteworthy, since it was the perfect spot to see the sun set. We had a wonderful day out in Margate and I will definitely be returning soon. 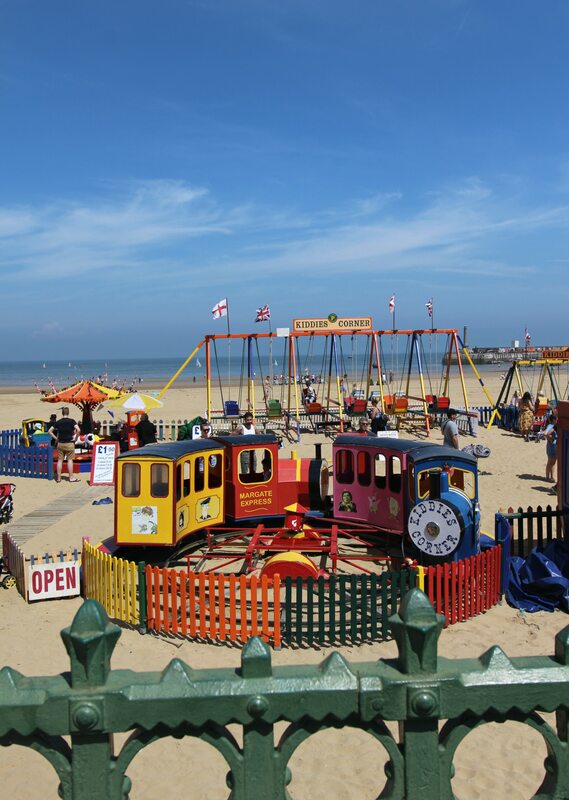 Finally, Southeastern is running a promotional offer of an Off-Peak Day Return ticket of only £20 during the Summer to Margate, so it’s the perfect time to go if you fancy a fun day out. This amazing offer ends on 24th August 2018. ( All are my photography and this was a paid partnership collaboration with Southeastern, while all views are my own).